The company's new Windows 10 S operating system, announced on Tuesday, will be Microsoft's latest attempt to tackle Google's surging Chrome OS. The OS is targeted at the education market, which in the U.S. is dominated by Chromebooks. Even with the new Windows OS, worldwide Chromebook shipments are expected to grow by double digits this year, analysts from IDC and Gartner said. The market share of Chromebooks has been growing up consistently since 2015. The new Windows OS is built like Chrome OS. PCs with Windows 10 S will be able to download apps only from the Windows App store. The OS is more like a "container" that will run apps secured and verified by Microsoft. A version of Microsoft's Office Suite will also come to Windows 10 S.
Similarly, Chromebooks run apps secured and verified by Google. Newer Chromebooks with touchscreens are also getting support for Android mobile phone apps, adding versatility to the devices. Google has positioned Chromebooks as an alternative to Windows PCs, though the devices have limited offline functionality and work best with an internet connection. Top PC makers are expected to ship Windows 10 S education laptops, starting at US$229, later this year. But those same PC makers are also selling low-cost Chromebooks, which are being used by 20 million students worldwide, with most of them in the U.S.
Windows is used in most PCs today, but it won't be easy for Windows 10 S to make a dent in classrooms, especially in the U.S.
About 10.8 million Chromebooks shipped in 2016, a 6.9 percent market share, according to Jay Chou, an analyst at IDC. Shipments are expected to grow by about 15 percent this year compared to 2016. Shipments totaled 7.7 million in 2015. Chromebooks make up about 6 percent of Acer's total PC shipments, and that number is growing, said Gregg Prendergast, director of Acer Pan America. Most of those Chromebooks are going to schools, and interest is growing among businesses, he said. This isn't the first time Microsoft's Windows has targeted Google's Chromebooks. In 2014, Microsoft tried to take on Chromebooks with low-cost laptops running the free Windows 8.1 with Bing OS. The doomed effort was scrapped when Windows 10 was released in 2015. At the time, Windows 8.1 with Bing was targeted at a wide range of low-cost laptops. PC makers regretted their embrace of Windows 8.1 on Bing after they loaded up their inventories with cheap laptops then were stuck with them when the PC market slowed down. Microsoft has smartly targeted Windows 10 S at the education market, Chou said. But Chromebook is preferred in classrooms because the devices are rugged, cheap, and easy to manage. The cloud-based implementation of Google's applications also works well. Chou's daughter uses a Chromebook at school and uses a Windows PC at home to log into Google Classroom. The combination works well, Chou said. Microsoft needs to target the education market to hook students, who form their opinions on what computing platform they will use in the future, said Mikako Kitagawa, an analyst at Gartner. That's how Apple developed its fan base, with many iPads and Macs used in classrooms in past years. Microsoft needs to capture that market, and Windows 10 S is one way to do so, Kitagawa said. Beyond providing cheap laptops, Microsoft will also need to match the simplicity of set up available with Chromebooks. Many schools don't have IT departments, and Microsoft has tried to make it easy to set up student Windows 10 S laptops in 30 seconds via USB drives. Chromebooks are selling well in North America, the Nordic countries, and in Australia and New Zealand. Microsoft's Windows 10 S has a chance to catch up in other countries where Chromebooks haven't been adopted widely yet. Microsoft's mainstream Windows 10 OS is already popular in classrooms outside the U.S. In the U.S., Chromebooks accounted for 58 percent of laptops shipped to classrooms in 2016, while Microsoft Windows had a 22 percent share, according to research firm Futuresource. For the rest of the world, the mainstream Windows OS held a 65 percent market share, while Chrome OS had a 9 percent share. Android OS had a 17 percent market share. Chromebooks and Windows 10 S laptops will have similar problems in some countries -- they both are set up for Wi-Fi, while cellular connectivity is the main way to connect to the internet in many developing nations and countries like Japan. Adoption of Chromebooks is also growing in the enterprise, especially in financial firms. They are a cheaper, lower cost, and mobile alternative to thin clients, which can be hard to manage, Kitagawa said. But PC makers aren't entirely excited about selling low-cost education PCs. Though it's a large market, the margins are thin. Because teachers can manage classroom laptops, PC makers don't earn money through support or services. Microsoft on Tuesday also launched the Surface Laptop with Windows 10 S, a high-end education laptop, which starts at $999. 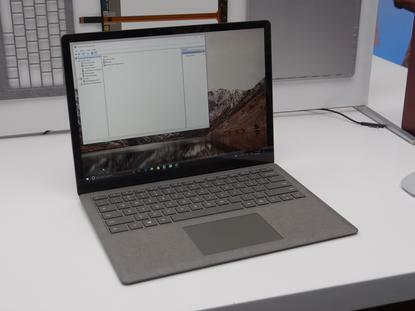 It can be upgraded to Windows 10 Pro to run applications available outside the Windows App store, making it designed more for college students.